Since the moment we first entered Downton Abbey in 1912, we have been swept away by Julian Fellowes' evocative world of romance, intrigue, drama and tradition. 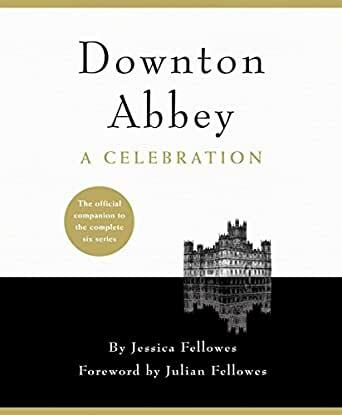 Now, in 1925, as Downton Abbey prepares to close its doors for the final time, Jessica Fellowes leads us through the house and estate, reliving the iconic moments of the wonderfully aristocratic Crawley family and their servants as they navigate the emerging modern age. Travelling from Great Hall to servants' hall, bedroom to boot room, we glimpse as we go Matthew and Isobel Crawley arriving for the first time, the death of Kemal Pamuk, Cora's tragic miscarriage, Edith's affair with Michael Gregson, Mary's new haircut, Thomas and O'Brien's scheming, Anna and Bates's troubles with the law, and Carson's marriage to Mrs Hughes. celebratory book is the ultimate gift for Downton Abbey fans the world over. "Downton Abbey - A Celebration" is going to be a must-own for fans of the series. The book celebrates the show through exploration of story, character, and setting. The book essentially jumps from location to location, with relevant character profiles sparsed throughout. For example, the pages about The Kitchen are accompanied by the profiles of Daisy and Mrs. Patmore; while after the pages on the Dower House you would of course find the profile of Violet. I really like how the content was assembled - it's an unconventional layout but one that is very intuitive. I should also mention that in addition to the great writing by Jessica Fellowes, the book includes hundreds of pictures. In fact, you can consider this book a visual companion to the series. At the very end of the book is an episode guide that briefly recaps every episode of the show. This is a welcome addition for someone looking to get a quick reminder of past events or wanting to identify a particular episode. Again, this includes all six seasons, so be careful reading until you've completed the series. .…be forewarned that the cover note "Includes Season 6 Spoilers" is accurate. From small details in the text and some of the, as always, beautiful photography to a near complete (except for the series finale, which hasn't been shown in the UK yet) season by season and episode by episode summary of the series- little details are sprinkled throughout. You don't get much, it won't spoil things for most fans or other readers. The book is bigger than the others in the series but not excessively so. I found the text very interesting, sometimes giving little details most people wouldn't know such as behind the scenes notes and film locations (including the Buckingham Palace interiors from season 4), well worth reading. The cast/character profile bits were good too. Good book, good series, both worth owning! 5.0 颗星，最多 5 颗星Anything Downton! Another beautiful Downton Abbey book. I have 4 others by Julian Fellowes/Jessica Fellowes and many of the pictures in this latest book are from the older books. May be a waste of money, but when it comes to anything Downton, you can never have too many authentically written by the Fellowes team. This book is outstanding - whoever did the photographs should receive an award. I LOVE it - the colored photos (and there are a LOT) are beautiful and you showcased each member of the Upstairs and Downstairs staff. This is handsome book and will remain on my table forever. It's like having the entire cast in your house - don't hesitate to get this book - it is a FOREVER book. I love it and thank you Amazon for carrying this spectacular masterpiece. 5.0 颗星，最多 5 颗星A marvelous book! As others have noticed - this goes into season six. Beware. Calling this book a "celebration" is quite apt. Or maybe an understatement. "Paean" might be better. It's a lavish book, well suited for fans of the show. And while it may be tempting to leave this on a coffee table, please resist the urge. There is a lot of good stuff in this book, from photos to background information on our favorite Brits. It's a substantial book, and while it's tempting to detail the content for you...it would also be to do a disservice. Simply put, if you are a fan of the show, you won't be disappointed with this book. It's fantastic.